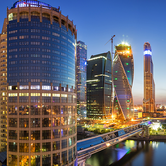 According to JLL, Moscow office take-up was recorded at 508,000 square meters in Q4 2017, a record high since the beginning of 2013. "Total 2017 office take-up volume exceeded our forecast and reached 1.28 m sq. m, up by 21% YoY." - says Elizaveta Golysheva, National Director, Head of Office Agency, JLL, Russia & CIS. - "The past year brought large transactions (over 10,000 sq. m) by banks and telecom companies in such buildings as IQ-Quarter, Aquamarine III, Oasis, Poklonka Place, Bolshevik (phase II) and Comcity. Overall, office occupiers were more active to secure attractive terms, with rents expected to start rising soon. The rising activity of private companies last year brought the take-up share of the public sector to 17% from 27% in 2016." Class A and B+ office space remained in high demand among domestic and international companies. Office transactions in Class B+ dominated the market in 2017 (at 55%), while the share of Class A deals was 35%. Following the trend of recent years, the activity concentrated in the area outside the Third transport ring (40%). Banks and finance companies, the dominant force in the demand structure in recent five years, accounted for 28% of the transacted volume in Q4 2017. Business services and manufacturing companies were also active, with 19% each. Some 408,000 sq. m of office space were delivered to the market in 2017, a 29% increase YoY. The bulk of these premises (312,000 sq. m, or 76%) were completed in Q4 2017. The largest projects in Q4 2017 and 2017 overall were Federation Tower - East and IQ-Quarter. Their combined office space (about 240,000 sq. m) accounted for 59% of 2017 completions. Completion of some projects, including Novion and VTB Arena Park, was postponed to 2018. Among major projects announced for this year are Park Huaming, Park of Legends, Bolshevik (phase II) and Empire II. Taking into account the current state of the announced projects, some of them will not be finished in time, and realistic 2018 completions will be about 300,000 sq. m (a 26% decrease YoY), JLL analysts estimate. The total office vacancy rate declined from 15.5% to 13.8% YoY. Only Class B- office buildings recorded vacancy growth (by 2.4 ppt to 12.2%), as tenants continued to favor higher quality premises. The Class A vacancy rate declined from 18.9% to 16.5%. The most significant decline was registered in Class B+ buildings, by 3.7 ppt to 13.5%. The total CBD vacancy rate was down by 1.3 ppt to 10.7%. 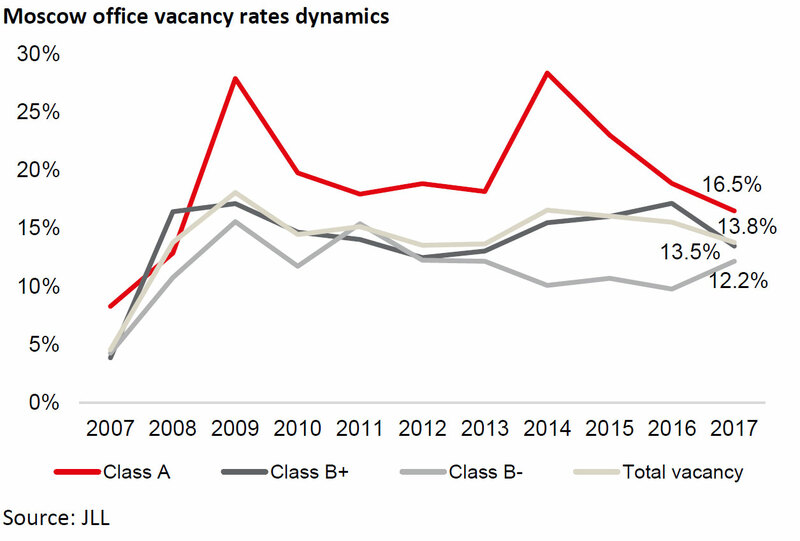 Large transactions in this submarket led to a Class A vacancy decline from 15.7% to 10.4% over the course of the year. "In 2017 tenants were actively purchasing and leasing office premises in under construction buildings. Some 74% of the office space delivered in Q4 2017 had been pre-let or pre-sold. 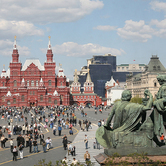 The VympelCom leasing deal in Bolshevik (phase II) presents a good example. This factor also supported a steady decline in office vacancies." - says Olesya Dzuba, Head of Research, JLL, Russia & CIS. - "Occupiers were less confident in acquiring unfinished office areas during the recession but now this practice gradually returns to the market. 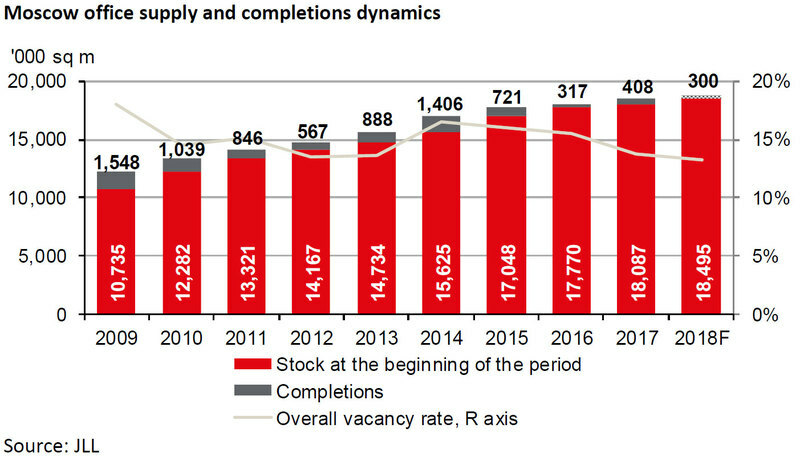 We expect this tendency to continue, and a part of future supply will enter the market with tenants when completed. According to our forecast, this will lead to further vacancy rate decline, to 13.1% by the end of 2018." 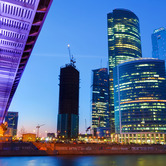 Moscow office rental rates remained stable in Q4 2017. Prime office asking rents were USD600-750 sq. 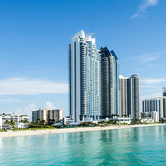 m, Class A rental rates were RUB24,000-40,000 sq. m/year. Class B+ rents were RUB12,000-25,000 sq. m/year. 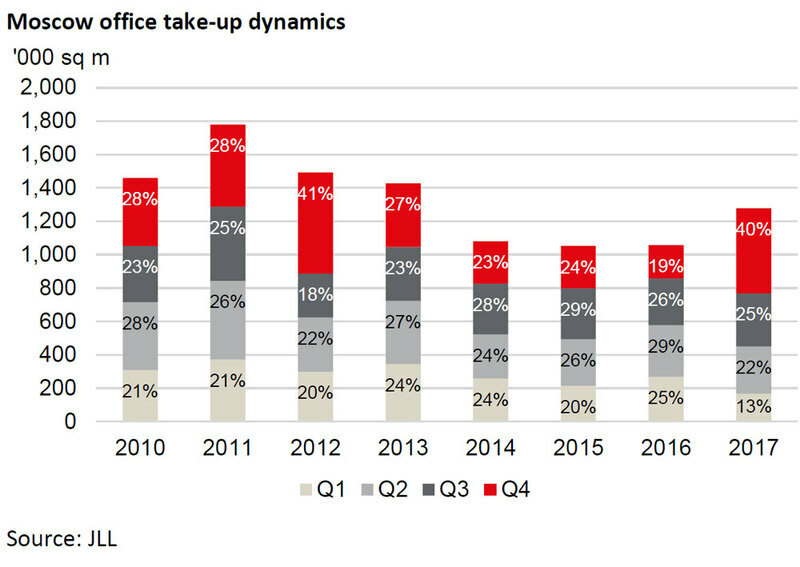 As demand for quality office space expands, JLL analysts expect moderate rental growth in some market segments in 2018.